RV retirement parks...all they have is shuffleboard and canasta right?....Wrong. The notion of what makes a typical day in an retirement RV park isn't very appealing unless you live in one. They are far from rocking chairs and blender meals. Most of these parks are age restricted one member must be 55 or older. The range of amenities can be overwhelming...but remember it is like being on a cruise ship, you do as much or as little as you want...you are in control. That is the way it should be you are retired. For the early riser, grab your coffee mug and head for the rec center. To get there, a mile away in a large park you can walk or take the golf cart. You are not a golfer?...you don't have to be to enjoy this very popular mode of transport. 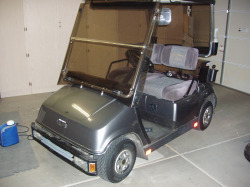 In fact we have one car and one golf cart. They are street legal for all streets up to a 35 mph speed limit. They make no noise, if its electric, and make zero pollution. After your cup of Joe and visiting with 300 of your closest friends. You go back to your lot. Now on your lot you may have one of three setups. Yep, some folks have their RV parked next to a fixed structure...some are 2 storys. The RV is protected by a canopy. Many people start out with an RV only, but as they come to love a particular RV retirement park, purchase a park model mobile home for a more permanent presence. After breakfast it is off to the lapidary room, a place where stones and minerals are tumbled and polished and made into jewelry. Your spouse is off to the woodshop to finish the dresser for the kids room back home. After lunch you put your clubs on the cart and you and your spouse play 18 on the course on site. It is couples day and at 5 after the round, you have drinks with your golfing buddies and do an autopsy on your missed putts. For dinner you can stay home and rest or attend the homeowner association pot luck dinner that is held 4 times a year. Tonight they are electing officers so you feel you should go. There you have it, another day of country club type living at the park that you have been coming to for the last 12 winters. You will be going north in April...but what is the rush. Put RV retirement parks on your list of places to check out.